Today is the last day for Deal of the week! that's more than 30% off the regular price of $15.95! Today's card is 4" x 4". I used the new set-Sparkly & Bright (115346) $17.95 plus the Merry Moments Designer Series Paper (115672) $9.95. I used the 1 3/8" circle punch along with the Scallop Circle punch. The Scallop Circle is popped up on dimensionals. The colors are Old Olive, Choc. Chip, Real Red and Very Vanilla. I also used Old Olive Grosgrain Ribbon. Stay tuned...for another card using the Sparkly & Bright Set. I decided to make a square card this time. 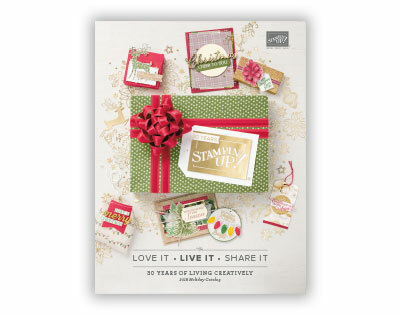 I used the Trendy Trees set (113258) $17.95 and the Big Shot Scallop Square Die (115950) $21.95. The Scallop Square is popped up on dimensionals. The colors are Old Olive, Choc. Chip, Always Artichoke and Very Vanilla. I also used Choc. Chip Grosgrain Ribbon. The Stamp-a-ma-jig helped to center the tree trunks. Stay tuned...tomorrow....4x4 card from the new set-Sparkly & Bright (115346). for the week's new deal. Here's the latest Deal of the Week. This one you don't want to miss out on! Our Styled Vanilla Hodgepodge Hardware adds class to any project. Cathy made these two cards using the Pocket Silhoettes stamp set (111672). This card is made with the Trendy Trees Stamp Set (113258). I love the color combinations with the new In Color Rich Razzleberry and Crushed Curry. Don't forget about the Deal of the Week! Here are more of her cards she brought to display. Cathy has even more samples that I will showcase tomorrow. Come on back then! Kerry Babylon, one of my downline, was very generous and brought some samples to my appreciation party on Friday. Here's are some of them. Circle Circus 115778 is used in the card above and below. Plus the sentiment is from Teeny Tiny Wishes 115730. Razzle Dazzle 116714 is the set from the card above. Plus the sentiment is from Teeny Tiny Wishes 115730. The card above uses the Christmas Punch Stamp Set (115366) from Hostess Level 2. The card above is similar to the 2nd card posted. That's because as demonstrators we receive a Stampin' Success Catalog every month. It gives us ideas of cards to demo. I changed my colors to Not Quite Navy, Regal Rose and Chocolate Chip. We used the same template just different colors and sentiments. That's what's so nice about Stampin' Up! You get inspired and you CASE it! CASE- Copy and Share with Everyone. Have you wanted to sign up to be a demo? Then now's a perfect opportunity. Demostratorships are only $85 Starting today. If you have any questions about demoing just shoot me an email: stampinred@comcast.net Or if you are ready to sign up you can do so on-line. You will need my password...stamper123. Can't wait for you to join my team. Being a demo is so much fun! It was the best decision I ever made! Stay Tuned...Tomorrow I will be showcasing Demonstrator Cathy Richardson's samples from the Appreciation party. Come back to see! Our Hostess/Customer Appreciation Party on Friday night was great fun! We had a few make-n-takes, raffle drawings, and samples of newest cardstock and designer papers. Thankfully Kerry and Cathy brought samples they had been working on for their own Stampin' Up! Workshops. I had been so busy with my family reunion I barely came up with the cards for the make-n-takes in time. I was so happy to hear they had samples to share. I will be showcasing their work the next few posts. THey have made some great cards and 3d items. We used the Elegant Bouquet Embossing Folder (115964) for the card above. Using a glue pen we added a little sparkle to the center of each flower using Dazzling Diamonds Glitter. It really pops on the card. The sentiment is from the Kind & Caring Thoughts Hostess Set. The cardstock is So Saffron and the Ribbon is the new in color Soft Suede. This card is the normal A2 size except you cut off one inch. Stamp the sentiment on the inside bottom of the card. This allows you to view the sentiment with the card in the closed position. I just love to 2 step stamp. This new set Greenhouse Garden (113824) is a lot of fun. I think I will be using this set a lot. Add sparkle to your projects with our Square Fire Rhinestone brads. From July 13–19, they're just $6.99—over 30% off the regular price of $10.95! Throughout July, be sure to check my web site every Monday at noon. I needed to make a couple of thank you notes for the president and vice president of our family company Bergmann's Laundry to thank them for putting on our family reunion. It was a wonderful day and everyone seemed to be enjoying themselves. Here I have used Real Red, Whisper White and Night of Navy Card Stock. The checkered paper is from the Country Living Kit on the post below. This paper is for wrapping sandwiches but I used it as a background piece for the card and the display of the card. 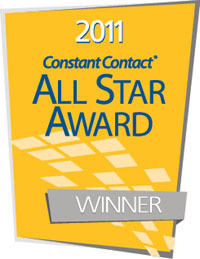 The card below was cased from a card inspired by Jenn D. I loved all the little stars. Especially the irridescent ice on the whisper white cardstock. It gives it dimension and stands out from the page. Here's what I came up with for our Family Fourth of July Reunion. I used the tent cards from the Country Living Kit. Instead of having the tents folded in half and having the entree listed on both sides I cut them in half and doubled the amount of them by placing them on Whisper White cardstock to form the tent card. I made two for each item on the buffet so it could be read on both sides of the table. Then, the design of the buffet tables changed last minute. So, instead of one buffet table we had 2 buffet tables. It worked out in the end but I was disappointed it wasn't perfect! Ha Ha...so Type A aren't I? Here are a few samples. Didn't get to them all I was a little busy making sure dinner went smoothly. If this looks like something you would love to have for your next cookout check out this kit. It has so much to offer. Throughout July, be sure to check my web site every Monday at 10 AM (MT) for the week's new deal. Stampin' Up! 2009-2010 New Catalog Release! Every week during the month of July, Stampin' Up! will offer one discounted product as a "Deal of the Week." No limits and no minimum purchase required. *Note: The noon start time is in line with the start of the new catalog sales period. Click on picture to view! 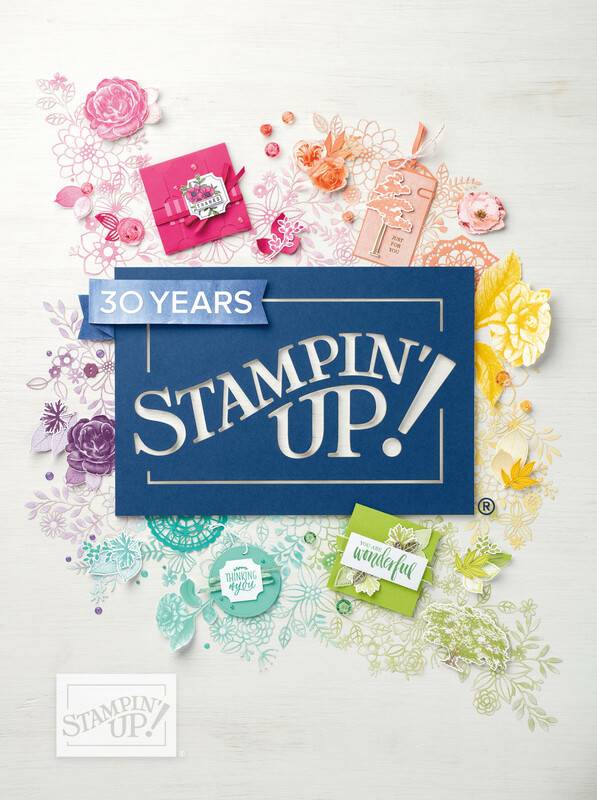 Tags: Stampin' Up! 2009-2010 New Catalogs Release!